In other words Anatolian Panthera, or Anatolian leopard..
but this is not about an African panther, this is about the Anatolian panther, a genuine native of Anatolia since the Neolithic ages and it’s last paw marks it has left on the highlands of Beypazarı back in 17 January 1974. Anatolia was gradually formed during the recent 400 million years when the old oceanic and continental pieces bundled with each other. 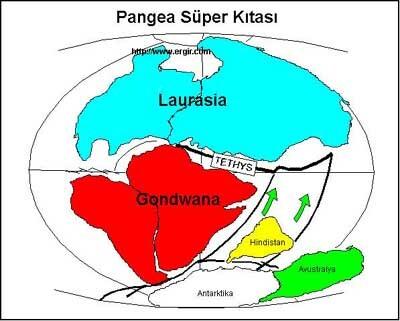 During another period that strecthed until approximately 250 million years from our time more older continents moved towards each other and formed the first ever large continent namely Pangea. This super continent was surrounded by an ocean called Pantalassa. Later onwards this super continent had split up as a result of shifting tectonic layers. ; thus two separate continents emerged, Laurasia in north and Gondwana in south. Between these two continents there was the huge Tethys ocean stretching in west/east directions and the west flank was blocked by land while east flank had opened wide in the shape of a ‘’V’’. Anatolia was a part of Tethys ocean. Anatolia’s jeodynamic evolution that extended to the years we live in had started sixty million years ago when the African continent tectonic layers shifted northwards. Until the end of Oligocene period (34-24 million years ago) , Alp – Himalaya mountain range and another mountain range again connected to this system which is Taurus Mountains in the south and Blacksea Mountains(Pontits) in the north of Anatolia , emerged which eventually created a closed Central Anatolia basin. 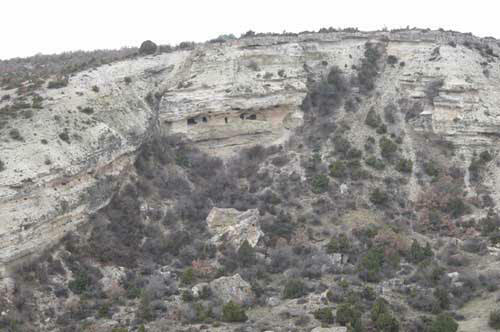 During Myocene period (23.8 – 5.4 million years ago) in addition to northward movement of the African continent, the Arabian layer has also moved northwards and clashed with the Anatolian layer; This caused even more escalation of the East Anatolian plateau and created ground passages where mammals could migrate. Around 14-16 million years ago, many mammals of African and Asian origin made their way through these passages and reached the fertile, fluorishing and promising fields and mountains of Anatolia. The Anatolian Panther’s roots goes back to those mammals and this species then evolved in its new homeland and became an endemic Anatolian mammal. With the appearance of Pleistocene period’s (1.7 million – 10000 years ago) ‘’ primitive man’’ in the Anatolian land approximately 78000 – 73000 years ago the panthers co-existed with this mankind. Following the disappearance of the ‘’ primitive’’ man and around 30000 – 10000 years ago ‘’ Homo sapiens sapiens ‘’ had emerged which was us, the ‘’evolved’’ mankind that ‘’ knows that he knows’’. As we got civilized, we developed our hunting skills and were able to kill our preys from long ranges whether they flew or ran away it did not matter all that much. 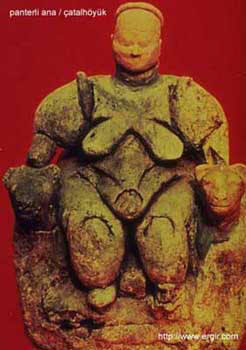 The destruction and extermination started in the beginning of 10000 years long Holocene period and continues even today. By this way, continuing a persistent killing of wild animals we had eventually shot the last representative of the Anatolian Panther that has always been the native habitant of these lands since archaic times and that had proudly took its honourable place on each side of a woman’s statuette dating back some 10000 years unearthed at Çatalhöyük mound near Çumra province of Konya. Now, wasn’t that a relief, we had finally wiped out the last panther in 1974?!.. And since then we thumbled, tossed and turned around, rolled over with great feeling of security, leopard skin patterned fabric material even on our underwear, no matter if our leopard skin imitated handbags were snatched away by city mobs, no matter if we were thrown out of train windows by youth gangs for our gimmicky mobile phones and no matter if we were deliberately assaulted right in the middle of a city and in broad day light. At least we did not have the risk of being attacked by a panther anymore since 1974 !!.. 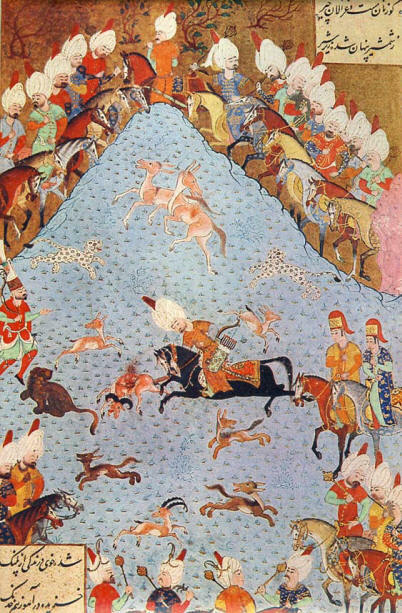 Historical evidences of Panthera Pardus Tulliana's existance in Anatolian Plateaus during the Ottoman Empire era can clearly be observed on the original ottoman miniatures. Here Kanuni Sultan Suleyman (Suleyman The Magnificent - 1520/1560 A.C.) is depicted killing an Anatolian Wild Sheep (Ovis Amon Anatolica) with his sword. This miniature is also a proof of Panthera Pardus Tulliana's co-existance with other species such as Wild Donkey, Wild Sheep, Wild Goat (Bezoar) Anatolian Lion and Roe Deer. 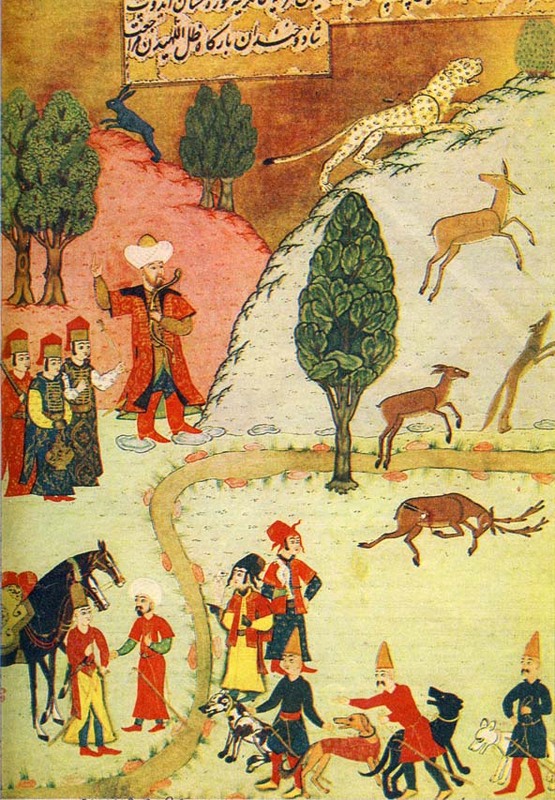 Here emperor Yıldrım Bayezid the 1st (1389/1402 A.C.) is depicted hunting Fallow Deer (Cervus Dama) with bow and arrow, while a Panthera Pardus Tulliana makes an escape on a steep hill. Other visible species are fox and hare. Before the 21st Century knocked on our door, many animal species had their own share from the blood thirsty aggression of mankind. Towards end of 20th Century we had witnessed the high risk of extinction of mountain gorillas following the bloodiest massacre of all times when Tutsi and Hutu tribes clashed near borders of Rwanda claiming over one million lives. Anatolian Leopard’s first scientific name ‘’ Fellis Tuliana ‘’ was given to this wonderful species in the year 1856 by a French Zoologist M.A. Valenciennes, he dedicated the name to Roman Marcus Tullius Cicero who gathered the first ever historical information on the leopard when he was the governor of Cilicia. 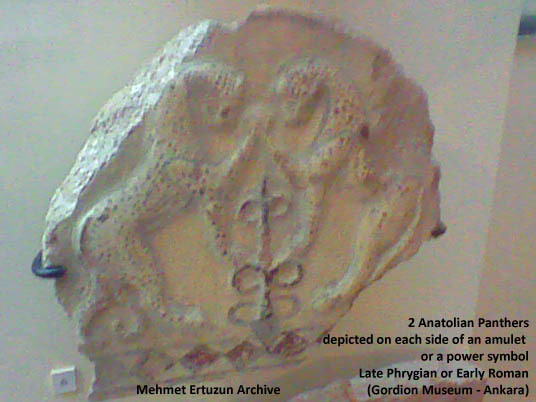 Anatolian panthers fought for their survival mainly in Aegean region, Taurus and Köroğlu mountains. 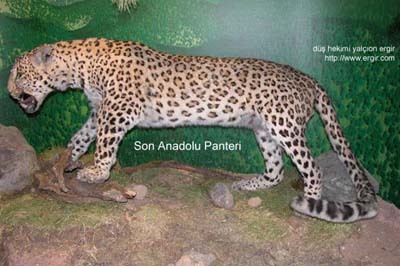 In the Eastern and South Eastern regions of Anatolia a different panther was a habitant, this was Panthera Pardus Saxicolor with a smaller body compared to that of Pardus Tulliana. 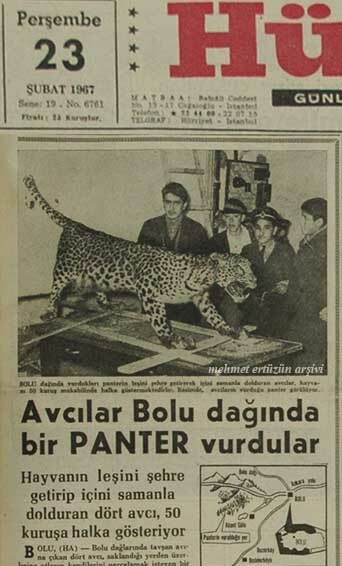 Tiger was also a genuine species of Anatolia until February 1970 when supposedly the last member of Panthera Tigris Virigata was shot and killed by a man named Şehit Şen. This was at Uludere, Hakkari and Prof. Dr. Turhan Baytop’s individual research indicates that this last Caspian Tiger’s pelt discovered three years later during 1973 had it’s tail missing, most probably smuggled into Iraq for dressing the whip of a tribe’s leader. Nihat Turan’s book on ‘’ The Mammals of Turkey ‘’ also refers to this incident. The pelt itself is said to be in Ali Üstay’s personal collection in Istanbul, naturally without the tail. The last member of Anatolian lion that also decorated the high reliefs of Hittites was shot and killed in 1890. Likewise, we did not allow our Cheetah to see and live the years of 20th Century. Throughout the 20th Century numerous Anatolian Panthers were either caught in tiger-traps or shot and killed relentlessly by buck-shots. Their pelts or dead bodies decorated shoulders of arrogant hunters posing to cameras. In any case, wasn’t it the first ever hunting regulation announced on 5 May 1937 that had ironically allowed killing of panthers and tigers at all times classifying them has hazardous animals? From Dilek Yarımadası peninsula, south of Kuşadası/İzmir all the way to Ağrı, nearly all of Anatolian land was made hell to the Anatolian panther. Some were shot so that snobbish people could show off with their leopard skin coats in their so called avantgarde society, some left to rot on walls of cafes while regulars smoked and played cards totally unaware of its value, some were shot and displayed at religious shrines along side other leopard pelts that shared same fate as Hadji Bekhtash, some were shot and found themselves at Aegean University Natural History Museum or Diyarbakır Main Airforce Base. The unluckiest ones detoriated and finally vanished being moved from one spot to another. But none of the hunters caused as much harm to Anatolian Panther as Mantolu Hasan(Coated Hasan) did. 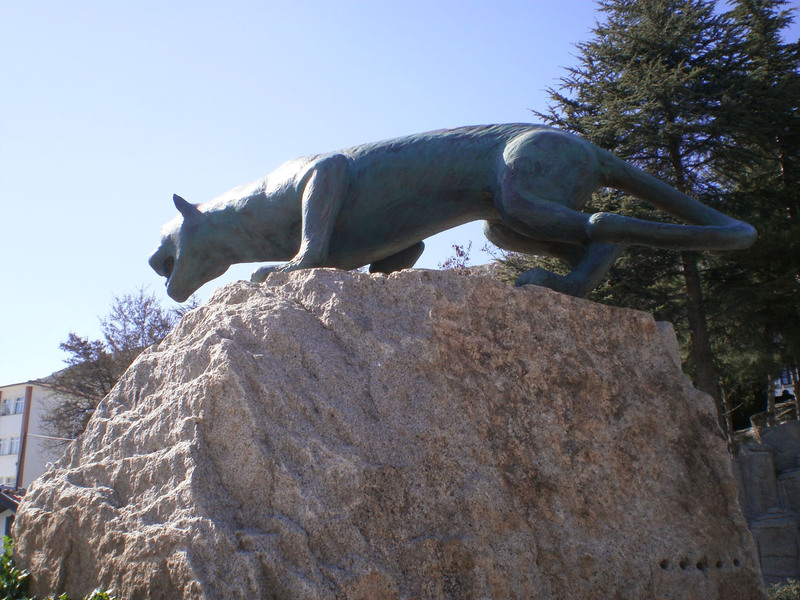 On his very own, Hasan Bele of İzmir claimed lives of at least 15 Anatolian Panthers between 1930 and 1950. This figure is shown as 50 individual panthers in Dr Hans Kumerloeve’s ‘’ Mammals of Turkey ‘’ research. Dr Kumerloeve is the first academic researcher that made the distribution map of Anatolian Panthera Pardus Tulliana in Turkey and he is renown as a figure that initiated scientific zoological work in Turkey during Atatürk’s time. 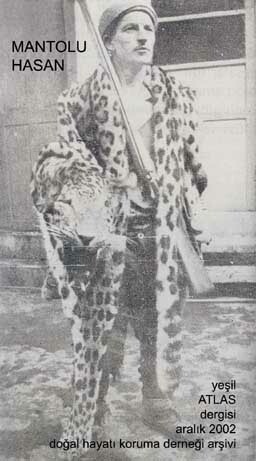 Mantolu Hasan mocked about some more time with leopard pelts of animals he killed hanging them on his shoulders like pelerines. His ruthless killings only ended when İsmet İnönü, the President of Republic of Turkey then awarded him with a brand new shotgun on strict condition that under no circumstances whatsoever he should even attempt to aim his gun at a panther. There happens to be only one single shot of the Anatolian Panther photographed in its natural surrounding in the wild and that photo was taken in 1949 by an immigrant German scientist namely Prof. Dr. Curt Kosswig. 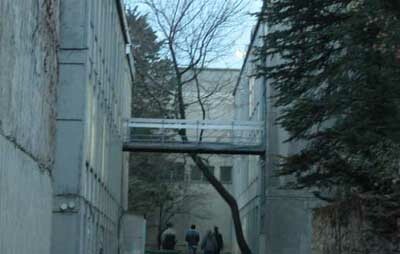 Location was Gölbaşı, Malatya. The photograph taken by Cafer Türkmen in 1946 is of a panther kept at İzmir Zoo named Zoza. Researcher Curt Kosswig has also discovered Manyas Bird’s paradise in 1 April 1938 along with his wife Leonore and also named this National Park the Bird’s Paradise. Yet another evidence of Tulliana’s existance within the hinterland of Turkey. In the year 1954, an individual was shot and killed nearby the village of Kurudere, Güney Town, Denizli(Inland Aegean territory) by a man named Koca Hasan. Did the infamous panther hunter of all times Mantolu Hasan(Coated-Cloaked Hasan) know he had a namesake at Kurudere of Denizli? We will never know, but the irony is there. This vintage photo shows school kids of Kurudere posing with the embalmed body of the Tulliana. - Poisoned by a peasant in January 1969 at Samandağ, Hatay after the panther mutilated his donkey. Poison was smeared on the very same donkey’s carcass. - Shot and killed at Karakale, Kars in 1970. - Seen separately one near Çatacık village of Mihalıççık, Eskişehir and the other at Ağrı mountain in 1972. And then it was 17 January 1974, Bağözü village of Beypazarı, Ankara. 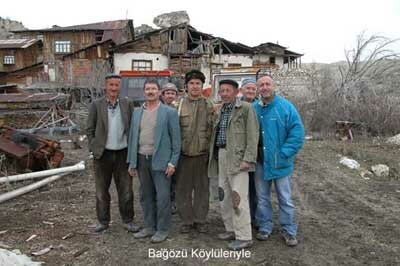 Bağözü village is a neglected poor little village at the foothills of Köroğlu Mountains with no school, no health cabin, no PTT branch or sewerage system. The inhabitants of the village survive with moderate farming and vineyards. The highest capacity Trona reserve rated as the second biggest one after the Wyoming reserve in USA was discovered right near the village. The soda ash is now being processed under the license of a private holding company. On the morning of 17 January 1974, Havva Köksal was walking down the village path towards the fields for picking ripe jerusalem arthichokes apparently a widely cultivated vegetable of the region along with carrot. Faster moving husband and father-in-law had already made the curve and disappeared beneath the hillside ahead. A large spotted cat was hidden in a 6 meters deep ditch which today is filled half with soil dumped by a bulldozer. While Havva woman has first ever glanced at an animal such as that, probably Benekli(Spotted) was aslo face to face with a human for the first time. Benekli was no other animal but the Anatolian Panthera Pardus Tulliana..
- A somewhat very long tailed creature was there at the side of the path. The very moment I spotted it and decided to move backwards it flew like a bird and landed on me, held my arm and shook me. When I opened my eyes, there it was sitting in a dog like posture. Then I must have lost my conscious again. Coincidentally Süleyman was heading back to the village from lumbering and had apparently scared off the animal so I have been told later. Benekli after flying four, five meters high had grabbed Havva’s arm with its strong jaws and broke her arm while shaking her body to and fro. 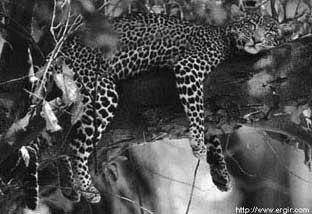 But there was another reality, Benekli had no intention to kill, it just sat down and waited by the side of unconscious Havva(Leopards are solitary and nocturnal animals; they mate every two years and generally in January-February period. They kill their prey with fatal bites on their neck if they have no horns and on their throats if they have horns. The peculiar movement style of this individual panther on the 17th of Januray and its courage to overcross its limits of secure wild habitat and also its hesitant attitude of not completing a full kill may be the signs of an animal on the heat looking for a mate). - Get up you, a beast is eating Havva woman. Our conversation with Havva was with a woman actually bitten first time ever by a leopard and most probably last time as well. - It was awesome, clean, I mean so beautiful, there was no dirt on it-like a carpet. It was lot different when alive. - Maybe I broke my arm when I stumped and fell. Her son serving for the army then in Izmir heard the confusing news, got alarmed in panic and rushed for Bağözü without granting any permission from his Garrison. God only knows what has came to his troubled mind during the long ride to his village. The armed villagers were soon after the ‘’ Spotted Beast’’ . 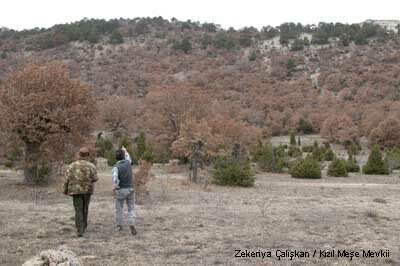 Other hunters joined the group from nearby villages of Başören and Çakıloba. A furious search was started. Benekli has met ‘’ The Human’’, its life was at stake and it was running away senselessly. After making it to the hill accross the village, it soon had to run back to its old track scared by a shepherd and his dogs. 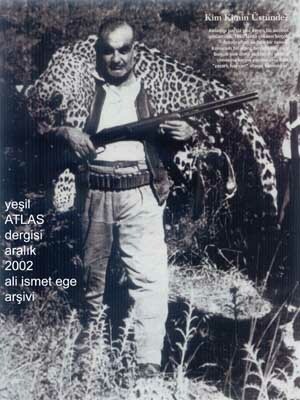 Ahmet Çalışkan was one hell of a hunter. He knew each and every ‘’ Gate ‘’ that meant the natural passages wild animals used as routes. Also alarmed by the suspicious swirls of a flock of ravens flying overhead he soon guessed a probable route that the animal may choose to follow so that it can make its way to the forest. Ahmet climbed the bushy hill, positioned himself under a tree and started waiting patiently in the area called ‘’ Kızıl Meşelik’’ just a few hundred meters north of the village. He wasn’t wrong. Benekli had appeared hurriedly with other hunter’s voices disturbing it from behind and when it came within approximately 150 meters range to Ahmet, the Mauser rifle’s barrel roared and the cracking sound echoed in the valley. Benekli had taken the first shot to its left shoulder bone. It was no time for escaping, the wounded panther had given up the instinctive breakaway efforts and deliberately started running towards Ahmet Çalışkan crushing and twisting branches coming on its way. One of them had to live. 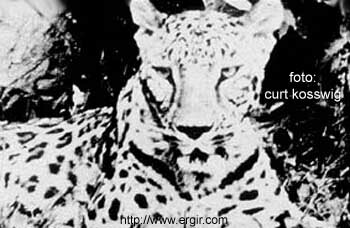 Ahmet Çalışkan repeatedly fired 9 times on the panther running towards him. Seven of these shots hit their target. But panther was still approaching, it was only about two meters when Çalışkan fired the last bullet that cracked the lower jaw. Benekli somersaulted and fell right on its chest. While Benekli was about to give its last breath Ahmet totally shaken off from what had happened started stroking its soft fur with mixed feelings. He still did not know what on earth this spotted animal was. Ahmet Çalışkan before he passed away in 1994 suffering from a highly developed asthma had tried to describe these emotions the best way he could to his son Zekeriya Çalışkan who now is the village Principal of Bağözü. 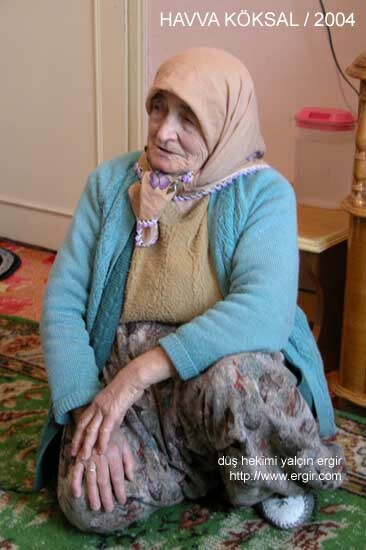 Later Benekli was tarnsported to the same State Hospital at Beypazarı where Havva woman was being given the medical treatment after she had an operation. Fate has rejoined Benekli and Havva, but this time after Benekli was punished severly that cost it its life. The town Council’s loudspeakers announced the arrival of a strange big cat and hospital was soon visited by anxious crowds. Each visitor that wanted to see and touch the panther was charged with 2 Turkish Liras for hospital aid and eventually money collected was good enough for purchasing a brand new x-ray equipment for the hospital. - This is now the hospital’s property. What he had in mind was grotesque to say the least, he wanted the coat of Benekli for his wife! - We will quarantine you for rabies. - Since nearly every Beypazarı habitant has visited the hospital to see and touch the animal, then this will mean a total quarantine of the town! That was the end of the argument and while Benekli headed towards Veterinary Bacteriology Institute in Ankara at the back of a jeep, the villagers headed to meet officials for questioning. A brain tissue check was made at the Institute proving negative, Benekli was clean. 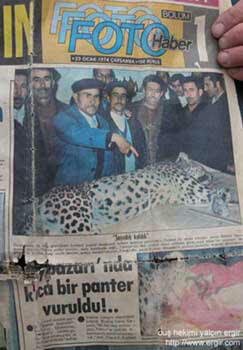 While national TV station and daily newspapers Hürriyet and Günaydın made the news public, Mehmet Ertüzün, a young university student then had already saved the newspapers clips and placed them in his personal archive never accepting the fact that we may have exterminated the one and only Panthera Pardus Tuiialana left in Anatolia. He did not know that one day would come and he would breathlessly share the saga of the Anatolian Panther witn an orthodontist, Dr Yalçın Ergir also renown as ‘’ Dream Weaver’’ Yalçın Ergir (dus hekimi). In the meantime, Mehmet’s articles were published in outdoor periodicals where he strongly fought for the idea that Anatolian Panther’s hunt should be banned totally and the animal be regarded as extint species. 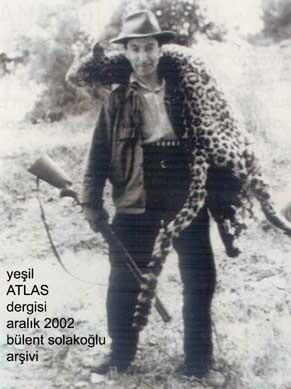 Maybe also with the small contribution of such efforts, what was missed back in 1987 by the Supreme Hunting Commission of the related Ministery was eventually considered in 2003/2004 hunting season and the official ban on the hunt of the Anatolian Panthera Pardus Tulliana was finally announced also bringing a 30.000 TL penalty charge for everybody breaching the regulation. 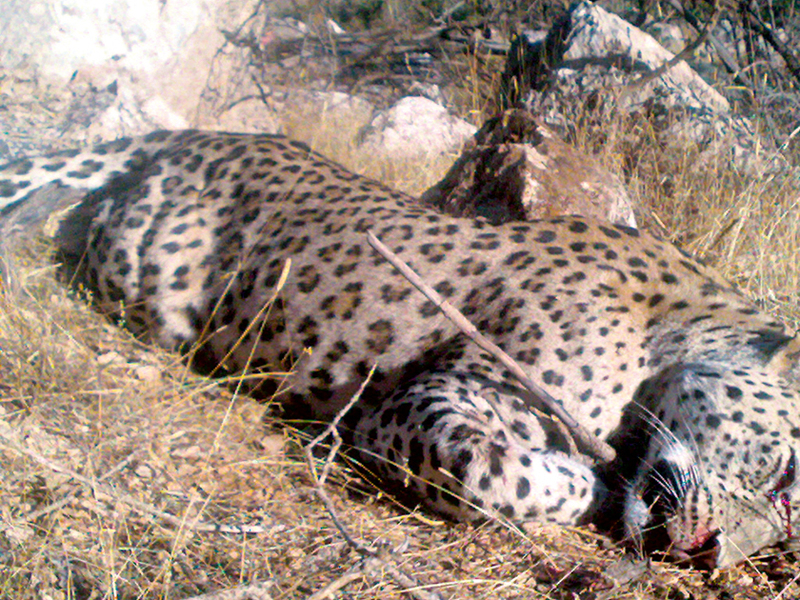 On the other side, ‘’ Dream Weaver’’(Düş Hekimi) was also informed on the sighting of another Anatolian Panther up at the hills of Çampınarı(Kahtama) village near Mut province of Mersin when he read the article of veterinary Deniz Cengiz Soykan in Atlas Magazine.The veterinary had once lived in Çumra not too far to the ‘’ Kaplan Gediği ‘’ (Tiger’s Hole) where the panther was exactly sited. And in the year2004, two very anxious and ambitious souls that each knew about the Anatolian Panther have miraculuously met each other. Guess through what common interest; the panther again. Since then they started a thorough search on Benekli by reaching all the original sources for reliable information. When the news hit the front pages of daily newspapers MTA paid 4.000 Turkish Liras to Bağözü villagers and bought Benekli for their Natural History Museum. Villagers initially intended to allocate the money for a daily room in their village from where villagers could benefit and completed the sub-basement of a small building for that purpose on a land adjacent to the village mosque.Then for a long period of time no attempt was made to complete the building. Eventually a cottage was built as the residence of the village imam. After meeting with mankind and loosing its life, not only that its species was at a serious risk of extinction but Benekli’s suffering had yet to continue. The panther’s brain was fed to mice at the Institute for experimental purposes during rabies check and then its body was left on a connecting patio between the two MTA buildings until an expert had arrived from İzmir to carry out a taxidermy job since there was no adequate facility within MTA compund to keep a dead animal intact and cold winter days of Ankara offered ideal temperature for storage. Benekli’s pelt was applied borax as preservative and its carcass was buried somewhere in MTA premises for future use if need be. Following years the exact location of the burial was never found and a new building was erected on the same area. In the year 1974 a pair of glass leopard eyes was not something that you would go out and fetch. But MTA staff Ergun Kaptan did not give up and his individual efforts yielded good result when he obtained a good pair of glass leopard eyes from Nihat Turan, a forestry engineer working for the Ministery. However, one of the eyes got lost rolling under a lavatory unit. For many years Benekli patiently waited for a promotion during his time in the dark basement gallery of previous MTA Natural History Museum and finally in 2003 it was moved to a well deserved and more appropriate location in the new museum building where it is currently displayed. However, the human touch was there and Benekli never looked the same way it looked when it spared the life of Havva Köksal by the ditch at Bağözü village. We think they still exist even though their numbers may be at a very critical level. There is a danger of exposing details of the researches to the public because should there be any remaining members of Tulliana family in the wild we may make them even more vulnarable. On the other hand exchange of valuable and credible information is also necessary as one never knows where even the slightest bit of information may lead us to a living legend. In any case all the information should be gathered and evaluated in the hands of experts, scientists and skillful people. This can then be followed by a professional team-work. Tracking down a suspected individual in its natural surroundings is a mammoth job. You need to have trap-cameras mounted on trees or bushes on a wide area. You need to lure the panther by specific methods. Trap-cameras are very sensitive to any kind of movement and can take instant photographs of wild animals once they step into the coverage ground of the sensor. This is just the beginning of the job and once you are lucky to photograph even a part of a panther’s tail then you have to narrow the suspected area and continue the search. Assuming that an individual is spotted and successfully tranquilized with a dart, then the animal has to be examined thoroughly taking blood and tissue samples and noting down necessary measurements. Once this is done then the animal should be strapped on the neck with a collar transmitter for monitoring. With this method you will not only track down the natural movements of the individual but you may also reach other living members if there are any. 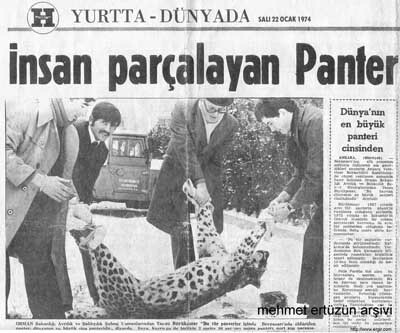 There has been rumours spread around that the specific Bağözü panther was rather a captive African origin leopard that had escaped from a farm in Polatlı province of Ankara where it was kept as a pet by a foreign diplomat and it somehow reached Bağözü village. 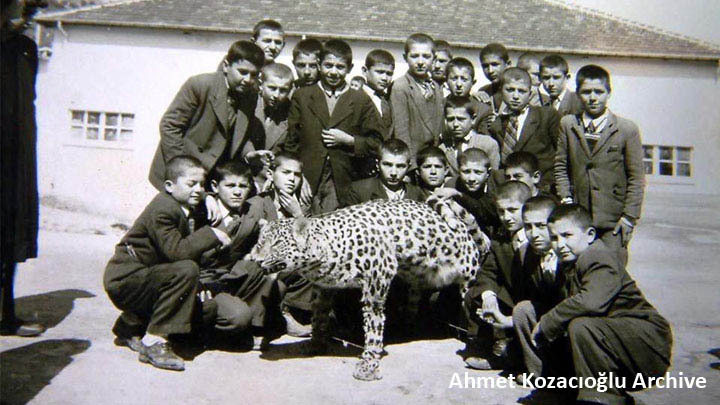 The distance that the young leopard must have traveled is at least 150 kms and the area between Polatlı and Bağözü is crowded with settlements of any kind from farms to villages, towns and the large city of Ankara. 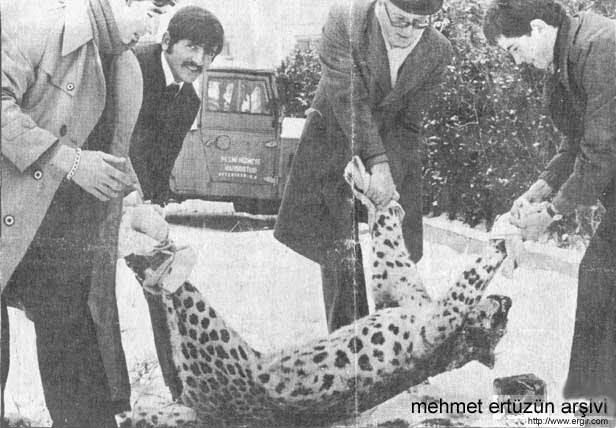 A similar allegation was put forward by others claiming that Bağözü panther was indeed an African leopard (Or imported from abroad)escaped from a farm in Çubuk province of Ankara in 1973 after it was given as a present by Ankara Zoo management to a wealthy individual. We must remind our readers of the fact that it seems a very unusual procedure for a zoo management to make such gestures and further, Prof. Dr. Ali Demirsoy, a respected and a credible scientist of Turkish Biology has claimed that a panther measuring 2.30 meters including the tail length and weighing nearly 100 kgs could not be a leopard that has just matured as an adult and he added that the panther of Bağözü must be an at least ten years old adult and a native of this geography. At these times Anatolian mammal fauna still offers small numbers of caracal and spotted lynx. But the claw and teeth marks left on Havva Köksal’s arm are the very last traces of Anatolian Panther, a genuine member of Anatolian fauna since Archaic times. Despite the loss of its valuable bones, Benekli’s tissue DNA sampling by cat experts can still yield reliable results with comparative checking. Currently from Termessos to Dilek Yarımadası peninsula many individual or WWF funded researches are made. Cemal Gülas expeditions made at Kaçkar mountains is yet another example. His formidable efforts provided interesting results and paw tracks of a suspected leopard was discovered on the forest floor measuring 15 cms in diameter and 10 cms in depth. It was estimated that this could well be the mark of an adult Panthera Pardus Tulliana as the marks of a Panthera Pardus Saxicolor could not result with such measuring. It is said that Saxicolor has a smaller body than that of a Tulliana and its lesser body weight could not leave such deep tracks. 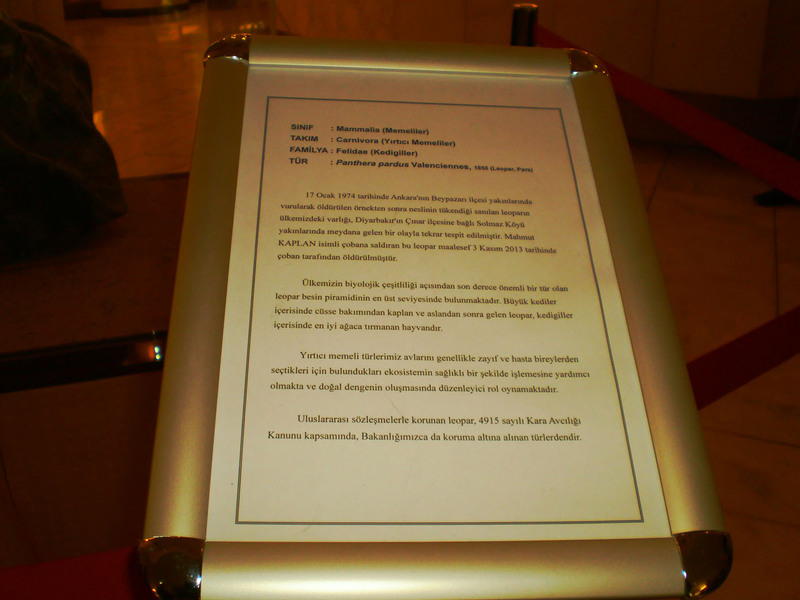 While TÜBİTAK’s(Turkish Scientific Research Institute) National Electronics and Cryptography Institute’s Linux operating system is presented and distributed around the country and a product of this project is named PARDUS, we expect to see the actual living members of Pardus Tulliana family discovered and preserved. 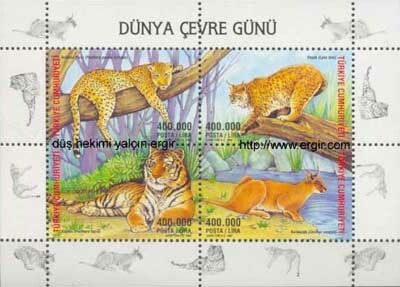 On 5 June 2002 Turkish PTT has issued block stamps to commemorate the World Environment Day one displaying our Benekli. We have no doubt that one day or night Anatolian Panther will show up blazing once again, however for this we need people like Hugo Van Lawick who dedicated his life to Serengeti National Park in Tanzania and documented the secretive life of wild animals in the constant tent village he set up. Noah’s spotted passenger, Anatolia’s last panther we cradled was thrown into the sea of Tethys while Anatolia’s children sat and watched pink panther on their black&white screens. Situation now is rather grim and it is about time to protect the inhabitants of this land like Chinese did for their precious Pandas. The information we gathered here is only a small pond of water on the route of generation’s migrations. Deep from our hearts we wish to hand over Anatolia to future generations with its unique culture, land and preserved natural habitat. What you have read above could never be achieved if the following valuable people and institutions did not painstakingly save years of information and if they did not generously share them with us. Anatolian Panther; one before the last. We once had a collective work with Mehmet Ertüzün and titled it as ‘’The Last Anatolian Panther’’. This time the location was in the vicinity of a small and remote village of Diyarbakır province at the south eastern flank of Turkey. Now it seems, we are at the very final moments of the INTERMISSON and about to watch the second half of a Horror Film. …. You look at the day, the dream is over or has it just begun? ‘’we are not yet at the final of a dream, perhaps right in the middle of it’’..
During the past few years(2010) an embalmed body of an Anadolian Panther suddenly came to daylight following a chain of some dramatic events. 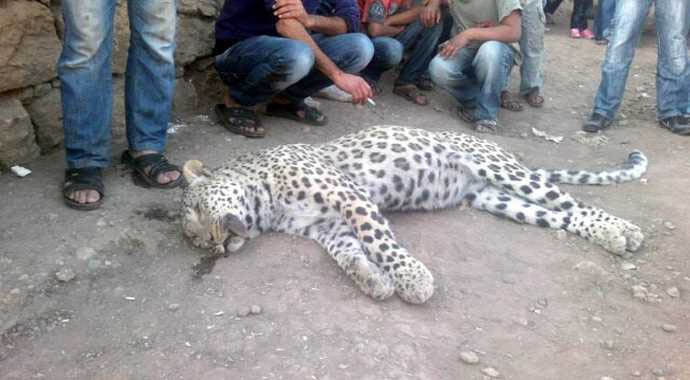 It was understood that the Big Cat’s body had been forgotten for quite sometime at a storage depot of Germencik Hunter’s Club, a province of city of Aydın, South West Anatolia. The Germencik branch manager for Nature Conservation and National Parks Directorate Mr. Mehmet Uzuner took over the official posession of the panther, had it examined and cleaned up. It was later determined that the embalmed body of this individual panther was to be displayed at the National Park Visitor’s Exhibit Hall of Doğanbey Village. However, soon after some comprehensive inquiries a tragic saga of yet another Anatolian Panther was brought to day light. The year was 1938; nearly some 80 years ago. A hunter namely Ömer Lütfü from Eski Kızılcagedik Village decides to go out for some woodcock shooting. Settles at a high ground among the bushes. But soon after and much to his surprise a herd of sheep and goats that were grazing a few hundred meters below suddenly start running in a total rampage to his direction. 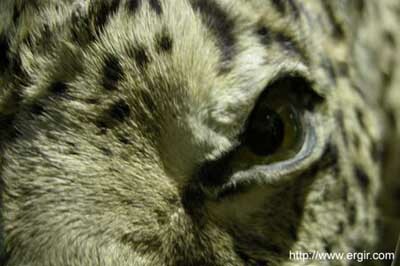 It wasn’t too long after that he came nearly face to face with a spotted big cat! With a hunter’s instinct he aimed towards the animal and pulled the trigger. He shot the big cat which later turned out to be a Panther but as his ammunition was prepared for small game birds the Big Cat was only scared off probably with some minor injuries, jumped upon top of a massive rock and then disappeared among the woods. Ömer Lütfü in total panic and maze tells all he lived to his villager companions after he settles down at village tea/coffee room. As we have witnessed many years after at the Bağözü Village of Beypazarı, Ankara, a group of volunteered hunters from the village gather together and start off a chase very next morning as the sun rises. 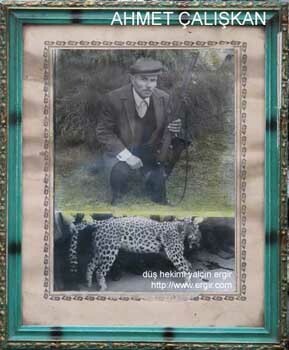 A man named Hacı Mehmet eventually notices the panther on top branches of a tree and guns it down. The ill fate on the living body of the panther contiues to haunt it on it’s pelt as well. The wives of the hunters start to taunt and yell at one another each claiming that their husband had shot the animal and that the pelt should be their’s !! Hopefully this ridicilous and senseless feud somehow comes to a halt and the Big Cat’s body is then turned over to Germancik Hunter’s Club officials. As noticed from the photos a very poor taxidermy job was done and inside of the pelt was stuffed with straws and more likely adequate preservative chemicals were short off and the pelt was not well preserved. In any case, a critisizm of that as of today will be quite unfair considering the non- availability of even the limited sources and lack off a skilled taxidermist especially at such a rural area in the year 1938. It is most probable that the embalmed body of the panther was exhibited at Germencik Hunter’s Club lounge for a considerable amount of time during which the pelt was effected badly by cigarette smoke, dust, moth and temperature changes. 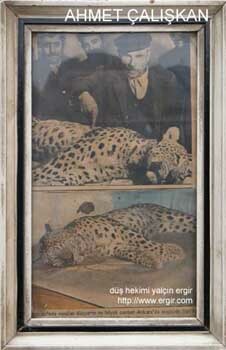 Then at an unknown date and time the panther’s body was removed to the storage depot of the Club and following a chain of coincidential events was brought to daylight and was included in the archive of Anatolia’s Panthera Pardus Tulliana as yet another unique specimen of this very valuable treasure of these lands. 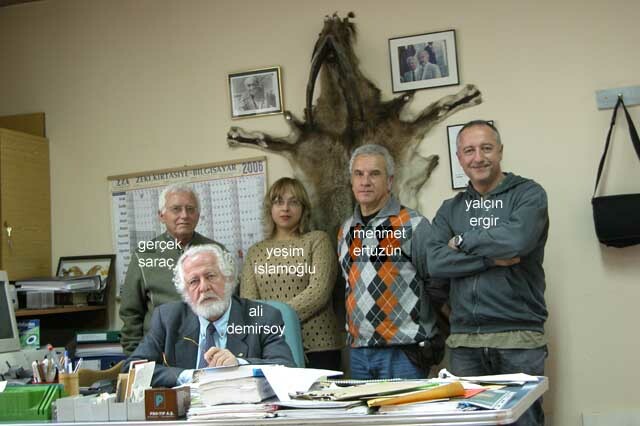 We should be thankful to the Germencik Hunter’s Club’s associates in the administration then, because if it wasn’t for them we wouldn’t be able to seeing, touching or even holding a chance to carry out scientific studies on this precious Anatolian inheritance they left to us. Following persistent efforts for conserving the vitality and awareness on the saga of the Anatolian Panther Pardus Tulliana, our struggles yielded very positive results during last year. 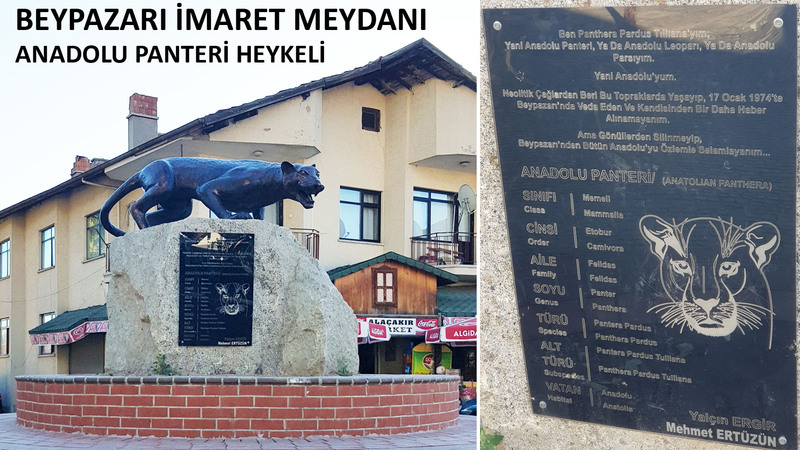 With credible endeavours of Mr Zafer Poyraz of Beypazarı Municipality who holds a key position as the Manager for Cultural and Social Affairs, a successively designed and completed life size leopard statue was erected at the most prestigious plaza of Beypazarı namely İmaret Meydanı. It rests on a monoblock granite pedestal weighing more than a ton which was brought from a nearby mountain where the legendary leopard of Beypazarı once used to roam around. 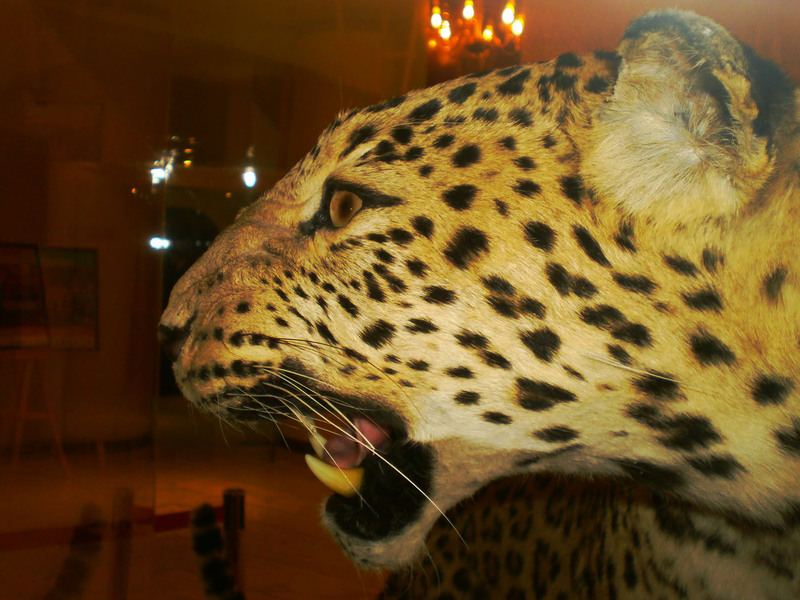 This monumental work is a well deserved symbol for the living legacy of Beypazarı leopard. We hereby thank them for their kind consideration for depicting our names on the plaque mounted by the side of the pedestal which we accept as an honorable gift for our contribution. 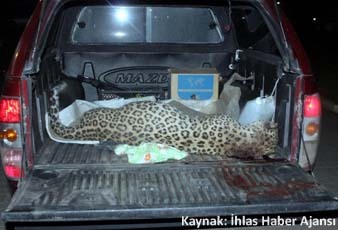 The leopard that was shot and killed at Village of Solmazköy, Diyarbakır at 2013/11/07 was later examined by a team of scientists from universities and carefully removed coat was brought to İstanbul undamaged and well preserved. The pelt was then dressed on a mould specially designed to fit the exact measurements of the leopard's original life size body. A professionally designed natural posture was given to the mould so that a closest impression and resemblance to a wild life version could be achieved. These are some images taken during the display of the leopard at a public presentation organized by the ministery.